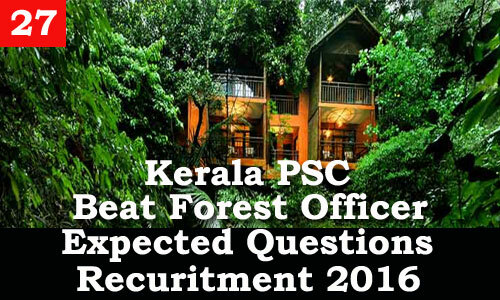 Kerala PSC - Expected Questions for Beat Forest Officer 2016 - 27, Kerala Beat Forest Officer Recruitment 2016, Important History questions. 1. Who was the last Mughal ruler? 2. 'Neel Darpan' is a play which portrays the oppression meted out by the indigo planters over the peasants. Who wrote this play? 3. Where was Gandhiji's first satyagraha in India? 4. Who founded the "Servants of India Society'? 5. Who was the British Governor General at the time of the 1857 revolt? 6. Which Governor General banned the practice of Sati? 7. Who was the editor of the newspaper 'the voice of India'? 8. Which Governor General was behind the introduction of the post and telegraph? 9. In which year was the partition of Bengal? 10. Which Viceroy was behind the partition of Bengal? 13. Who was known as the 'Father of Indian Renaissance'? 14. Who was the first person amongst the educated Indians to sail to England in 1830? 15. Who conferred the title 'Raja' to Ram Mohan Roy? 16. Ram Mohan Roy founded the BrahmoSabha in the year....? 17. A Gift of Monotheists' is the famous work of......? 18. Who was the first to give the call of 'India for Indians'? 19. Which is the most important work of Dayananda Saraswati? 20. What was the original name of Dayananda Saraswati?